MUMBAI – MAHARASHTRA – INDIA FEBRUARY 19, 2014 02.30 P.M.
2014 is the 25th year of my acting training career. 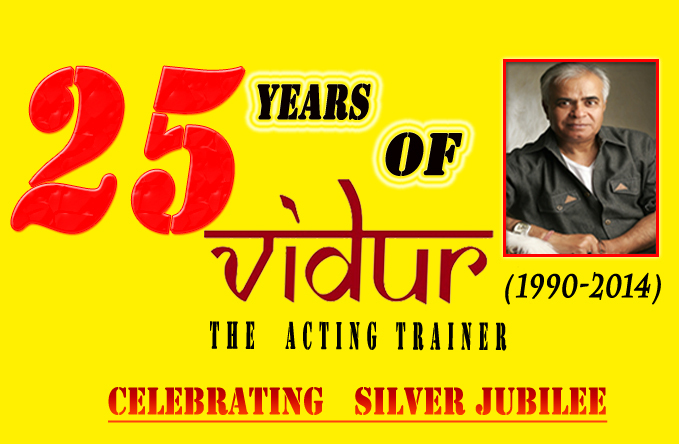 In the Silver Jubilee year of my acting training career, I am posting …..57 th ……edition of Vidur’s Film Diary. Month of January 2014 saw the unabated victorious march of ” Dhoom 3 “ , the highest all-time grosser of Hindi film industry. It earned 272 crores within 04 weeks and created a new record after dashing all previous box office records and finally collected 284.27 crores. ” Krrish 3 “ , a Hritik Roshan film , stands second with the All – India net collection of INR 244.92 crore in India and INR 300.00 crore worldwide . ” Chennai Express “ stands third with INR 227.13 crores . ” Jai Ho “, a Salman Khan starrer, was released in the 4th week of January 2014 it and finally ended the long march of ” Dhoom 3 “. It is the new member of 100 crore club. It finally earned INR 110.78 crores. The Silver Jubilee year of my acting training career is also important and significant for one more reason. ” Jai Ho “ becomes the first ever film to have 8 students of mine in one film . DAISY SHAH , GENELIA DSOUZA , ASMIT PATEL , PULKIT SAMRAT , TULIP JOSHI , VATSAL SHETH , & VIKAS BHALL are the actors and ALVIRA AGNIHOTRI is the Costume Designer of the film . In total …………… 10 …………….. films got released in January . Out of these ………….. 10 ………… released films ……….. 04 ………… films have …………… 15 ……………. artistes , who are trained by me . Out of these ………. 15 ……… persons , ………… 12 ……….. are actors . Among the rest ………. 03 ……. 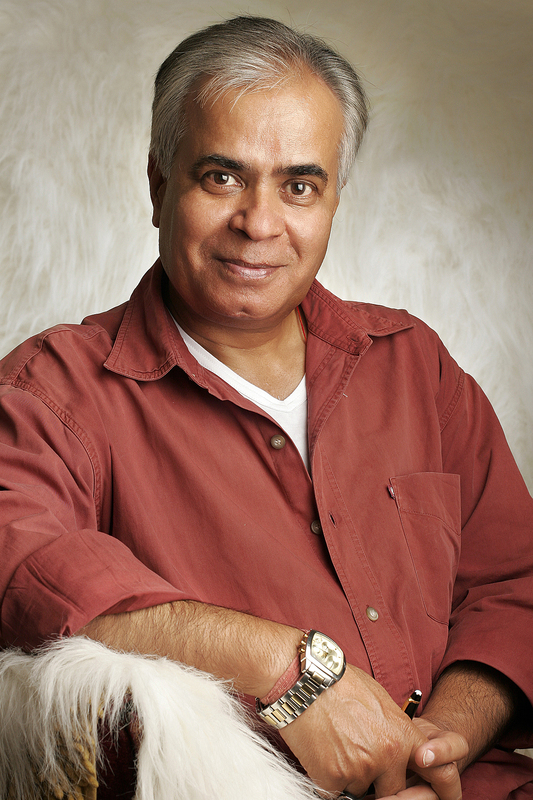 Amit Kapoor and Krishan Kumar are the producers of ” One By Two ” and ” Yaariyan “ respectively . Alvira Agnihotri is the Costume Designer of ” Jai Ho ” . 1 – Viraf Phiroz Patel is playing an important role in ” Ek Boond Ishq “ on Life OK TV . 2 – Manish Naggdev is playing an important character in ” Pavitra Rishta “ on ZEE TV . My ……………. 02 ……….. students in ………… 02 ……………. shows on TV . 1 – Hritik Roshan is the Brand Ambassador of ” J. Hampstead ” . As an acting trainer / acting tutor , though , it was not a very significant and satisfying month , but still I am happy . My 15 students appeared in 04 films , 02 students in 02 TV serials and 01 student appeared in 01 Ad also . 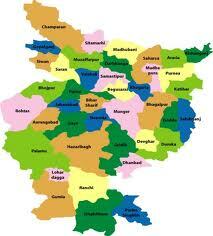 Thus total number of students working in the month of January 2014 comes to 18 . 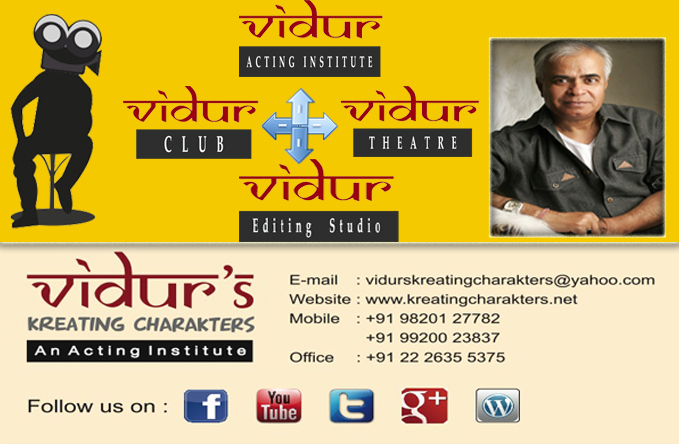 On behalf of all the students and staff of VIDUR Acting Institute , I congratulate all my above mentioned 18 students . MUMBAI – MAHARASHTRA – INDIA SEPTEMBER 05, 2013 00.35 A.M.
Month of August 2013 will always be known for ” Chennai Express ” . The film is the fastest 100 crore earner in the history of Hindi cinema and finally it crossed collections of ” 3 Idiots “ also . So officially now it is the highest grossing film in the history of Hindi cinema . It collected INR 222 crores and still running . First week of the month got some 6 poor and forgettable films . But the second week changed all . This month also created history because of ” Love in Bombay “ . The Joy Mukherjee and Waheeda Rehman starrer film got theatrical release after 42 years of its completion . A well-known costume designer of 60s and 70s , Mani Rabadi died this month . She was sister of yesteryear actress Shammi . Apart from Bhanu Athaiya , she was another one , who was a professional dress designer in the early years of our film industry . Starting with ” Jewel Thief ” [ 1967 ] , she continued working till ” Hum Aapke Hain Kaun ” [ 1994 ] . ” Jewel Thief ” [ 1967 ] , ” An Evening In Paris ” [ 1967 ] , ” Bobby ” [ 1973 ] , ” Amar Akbar Anthony ” [ 1979 ] , and ” Pestonjee ” [ 1987 ] are her famous and most successful films . She also won National Film Award for Best Costume for ” Pestonjee ” . In total …………… 14 …………….. films got released in August . Out of these ………….. 14 ………… released films ……….. 08 ………… films have …………… 14 ……………. artistes , who are trained by me . Out of these ………. 14 ……… persons , ………… 11 ……………… are actors . Among the rest ……………….. 03 ………………. Shweta Pandit is the singer in ” Satyagraha “ , Shekhar Ravjiani of Vishal-Shekhar fame is the music director of ” Chennai Express “ and Monojoy Mukherjee is the co-producer of ” Love In Bombay “ . 1 – Bengali : Preeti Jhangiani is doing lead in ” Mistake “. 1 – Veebha Anand is playing an important role in ” Kairee ” on Colors . 1 – Nasirr Khan is playing lead in ” The Big Fat City ” . 2 – Tanishaa Mukherjee is playing lead in ” The Verdict ” . My …………… 02 ………….. students in ………….. 02 …………. plays . 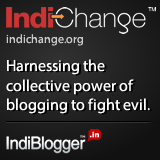 1 – Ankita Bhargav is in the campaign for ICICI Gold Loan . 2 – Imran Khan is the main model for Maza . 3 – Saif Ali Khan is the main model for Lays . 4 – Sonam Kapoor is the face of India International Jewellery Week . 5 – Priyanka Chopra is the brand ambassador of Asmi Jewellery . My ………….. 05 …………… students in …………… 05 …………… commercial campaigns . I am happy that as an acting trainer or acting tutor I had a very satisfying month . My 14 students appeared in 08 films , 01 students in 01 TV serials , 01 student in 01 regional film , 02 students in 02 plays and 05 students appeared in 05 Ads also . Thus total number of students working in the month of August comes to 23 . I am happy to announce that some upstarts are feeling the heat now . They are resorting to all kind of canards and lies . They are running a mischievous campaign and trying to malign my name . But my journey continues unabated . These revellers of failed legacy will eat crow very soon . Dust is now settling down quickly . On behalf of all the students and staff of VIDUR Acting Institute , which is known as Vidur’s Kreating Charakters , I congratulate all my above mentioned students . VIDUR Editing Studio , VIDUR Club and VIDUR Theatre would also like to wish them well in their glorious journey ahead . May they shine in their chosen field ! MUMBAI – MAHARASHTRA – INDIA AUGUST 13, 2013 01.45 A.M.
Day before yesterday on 11 August I was sitting in my study in the night and was going through the bunch of newspapers . Suddenly I noticed a front page news in Bombay Times of Sunday Times of India . It was about 150 Crore Film Club . It was an intriguing article . And it definitely was a new revelation . Earlier there used to be a 100 Crore Film Club . 22 Hindi films are there in this club . ” Ghajini ” [ 2008 ] , ” 3 Idiots ” [ 2009 ] , ” Dabangg ” [ 2010 ] , ” Golmaal 3 ” [ 2010 ] , ” Ready ” [ 2011 ] , ” Singham ” [ 2011 ] , ” Bodyguard ” [ 2011 ” , ” Ra.One ” [ 2011 ] , ” Don 2 ” [ 2011 ] , ” Agneepath ” [ 2012 ] , ” Housefull 2 ” [ 2012 ] , ” Rowdy Rathod ” [ 2012 ] , ” Bol Bachchan ” [ 2012 ] , ” Ek Tha Tiger ” [ 2012 ] , ” Barfi ! ” [ 2012 ] , ” Jab Tak Hai Jaan ” [ 2012 ] , ” Son Of Sardar ” [ 2012 ] , ” Dabangg 2 ” [ 2012 ] , ” Race 2 ” [ 2013 ] , ” Yeh Jawaani Hai Deewani ” [ 2013 ] , ” Bhaag Mikha Bhaag ” [ 2013 ] and ” Chennai Express ” [ 2013 ] . In this exclusive club , I have 7 students of mine . They are ; Kareena Kapoor [ 4 Films ] , Priyanka Chopra [ 3 Films ] , Katrina Kaif [ 2 Films ] , Ranbir Kapoor [ 2 Films ] , Hritik Roshan [ 1 Film ] , Anushka Sharma [ 1 Film ] and Kalki Koechlin [ 1 Film ] . Director Sajid Khan [ 1 Film ] and Music Director Shekhar Ravjiani [ 1 Film ] are also there in this club . Thus out of 22 films in 100 Crore Club , my students are there in 14 films . It is unprecedented . And it comes to a whopping 64 % success ratio . Out of 12 actors , who are there in this club , 7 are my students . It brings my success ratio to 59 % in this category too . But seems to be passe now . 100 Crore Club is now common . The latest benchmark is 150 Crore Film Club . And till date it has only 4 members . And hold your breath , my students are there in all the 4 films . God ! it comes to 100 % success ratio . ” 3 Idiots ” [ 2009 ] has Kareena Kapoor . ” Ek Tha Tiger ” [ 2012 ] has Katrina Kaif . ” Dabangg 2 ” [ 2012 ] has Arbaaz Khan and ” Yeh Jawaani Hai Deewani ” [ 2013 ] has Ranbir Kapoor and Kalki Koechlin . And they are there in all the categories . Among 3 actors , there is Ranbir Kapoor . Among 4 directors , there is Arbaaz Khan . And among 5 actresses , there are Kareena Kapoor , Katrina Kaif and Kalki Koechlin . I am bringing out above facts with all the humility at my command . It’s not like blowing one’s own trumpet . In this field of film acting training , some acting trainers have become experts in false claims . Thus it becomes necessary to post facts for the gullible public . In this field where some acting trainers have metamorphosed into pathological liars , it has become imperative to make general public aware of the facts . So I am presenting the facts . I know that fringe-players will cringe again and immediately start their vitriolic campaign . Upstarts will start hurling abuses . Uncouth will unfurl their flag of arrogance . Stone -pelters will be active again . And I will be subjected to choicest cuss words by uncultured and self-appointed descendents of Stanislavski . But It hardly matters . I agree with the saying in toto . On behalf of all the students and staff of VIDUR Acting Institute , which is known as Vidur’s Kreating Charakters , I thank God for His blessings and unending kindness . 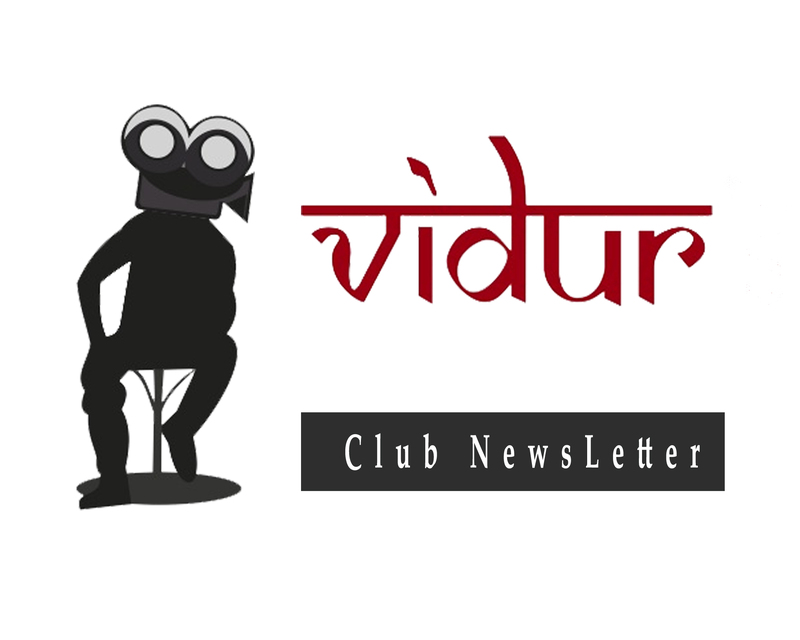 VIDUR Editing Studio , VIDUR Club and VIDUR Theatre would also like to humbly express thankfulness .